TECHNICOLD® Blow Thru Air Handlers are designed to be used as space coolers or heaters. 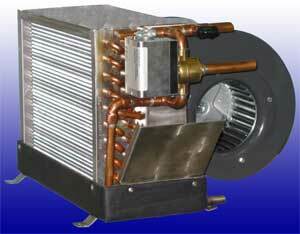 These air handlers utilize hydronic cooling or heating with option of an integral electric heater. Because the heater is encased inside the housing of the air handler, no additional space is required for the installation as is the case with external heaters. Alternately, a Germicidal UV air cleaner can be installed inside the unit providing for a clean, mold free environment. A key feature of TECHNICOLD® blow thru air handlers is the blower motor assembly precedes the cooling and heating source, it is only subjected to return air temperatures. The cooling effect of the high volume ambient air passing over the motor makes for a more efficient motor and longer service life. The energy savings coupled with reduced service/repair costs relates to significant long term savings. TECHNICOLD® blow thru air handlers are non-ducted and should be located high in the cabin space. This design provides high CFM with low velocity for a quiet diffused air delivery, thus providing a High BTU/CFM ratio for maximum temperature rise to outlet temperature rating. Note: Above dimensions include water valve. For remote water valve installation subtract 3" from width. All air handlers are available with down discharge or remote blower. Larger or custom designed air handlers are available upon request. Tropical Marine Air Conditioning, Inc. services and sells marine equipment and Technicold marine A/C parts marine parts- Marine Air, AquaAir, Technicold, and Cruisair air conditioning, refrigeration by U-Line, Spot Zero and Sea Xchange, ECOmar Sewage Treatment Systems, and ice machines Eskimo Ice. CONTACT US for your marine parts and equipment needs.